Picturing Disney: Want to win a Disney Dooney? or maybe a Disney Gift Card? Want to win a Disney Dooney? or maybe a Disney Gift Card? As you guys already know, I love my fans! Whats next? Well I am teaming up with some of my other Disney friends to bring you another awesome contest where one lucky winner will win the Disney Dooney & Burke purse pictured above and the runner-up will win a $100 Disney gift card! I don't know about you but I like those odds- two awesome prizes but only a limited time to enter! Check out the details in the Rafflecopter below for my co-sponsor information and your chance at multiple entries! Oh how I would love to win this one!!! I have been dreamin about a Disney Dooney forever, but I just have not been able to justufy spending that much $ on one for myself. 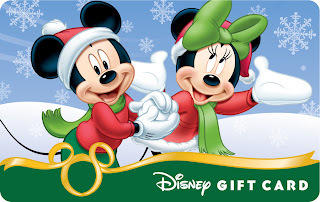 The Disney gift card would be great to stock up on things like autograph books and other great suprises for our Disney trip in October! Good luck everyone! !